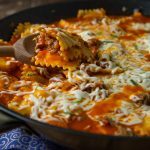 Easy Baked Ravioli – Just a few simple ingredients for a super easy, cheesy, and delicious dinner recipe the whole family will love. What is your kind of comfort food? For me, it is either Indian food, chocolate desserts, or any kind of pasta. I think my husband would say pizza. And my son would say pasta skillet. I sense a pattern….carbs. No surprise there, carbs make pretty much everyone feel better. And what goes better with pasta that more carbs, like Cheesy Garlic Bread. So today I am combining all of our favorites into one dish, we all love. 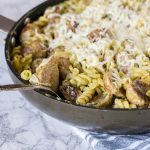 Cheesy, pasta, and spicy sausage all in a delicious sauce. Everything bakes together to get all gooey and yummy! 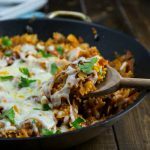 And if you are looking for another version this Mostaccioli is next on my list to try! 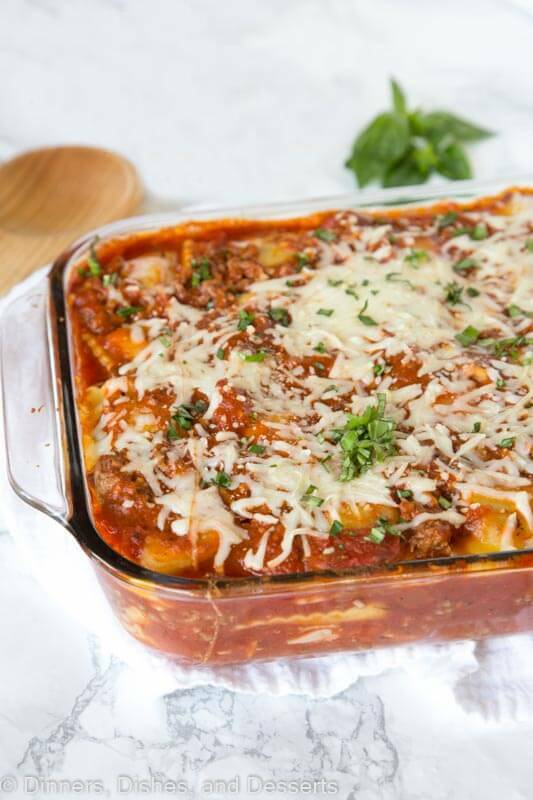 This easy baked ravioli comes together in just minutes, and is perfect for any night of the week. I love it because it makes a enough for a crowd. So I can make it when we have family or friends over without a ton of work. 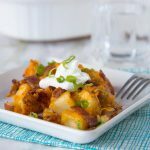 It is one of my go to recipes when I am going to be out of town too; that way my husband and son can eat a home cooked meal the whole time I am gone! 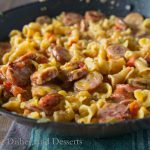 I used Italian sausage in this version, because we love the spice and flavor. 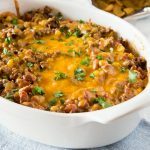 You could use ground beef or even leave out the meat. 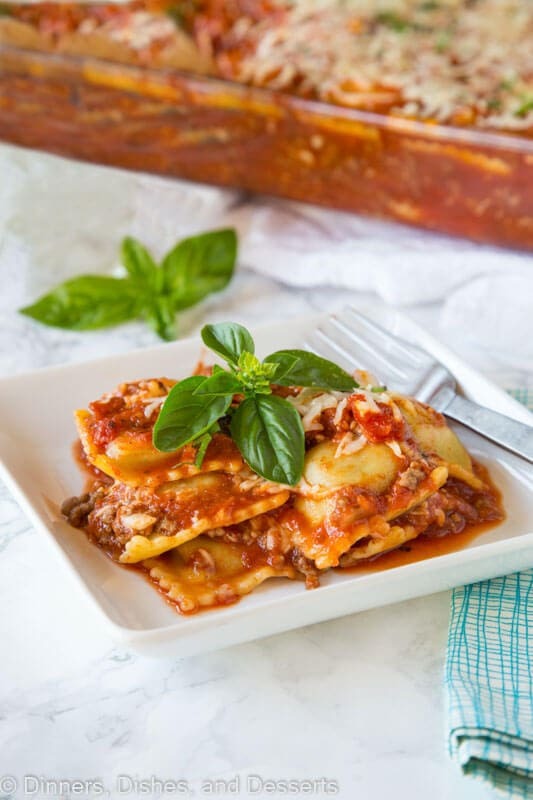 You will want to use cheese ravioli when using meat, otherwise it will just taste like meat. But if you don’t put any meat in the sauce, then you can use whatever flavored ravioli is your favorite! 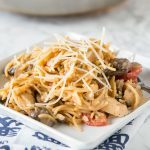 Serve with a salad or garlic bread and you have a complete meal the whole family will love, and it is even nice enough to serve to guests! 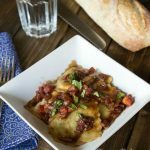 Want more recipes with ravioli? 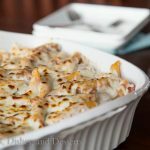 Easy Baked Ravioli - Just a few simple ingredients for a super easy, cheesy, and delicious dinner recipe the whole family will love. 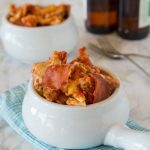 Easy Baked Ravioli - Just a few simple ingredients for a super easy, cheesy, and delicious dinner recipe the whole family will love. Preheat oven to 350 degrees. 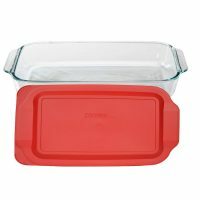 Spray a 13x9 inch baking dish with non-stick spray. Set aside. Heat a large skillet over medium high heat. Add sausage and onion. Break apart the sausage and cook until no longer pink. Drain any fat. Add garlic and cook for 1 minute. Stir in sauce and Italian seasoning, simmer for 5 minutes. Spread 1 cup of sauce mixture over the bottom of the prepared baking dish. Place 1 single layer of ravioli over the sauce. Pour 1/3 of the sauce and sprinkle 1 cup of cheese evenly over the top. Repeat with the remaining ingredients. Cover with foil and bake for 35-40 minutes, until bubbly. Remove the foil and bake for 5 minute until cheese is melted and golden. Remove from oven and sprinkle with basil to serve. 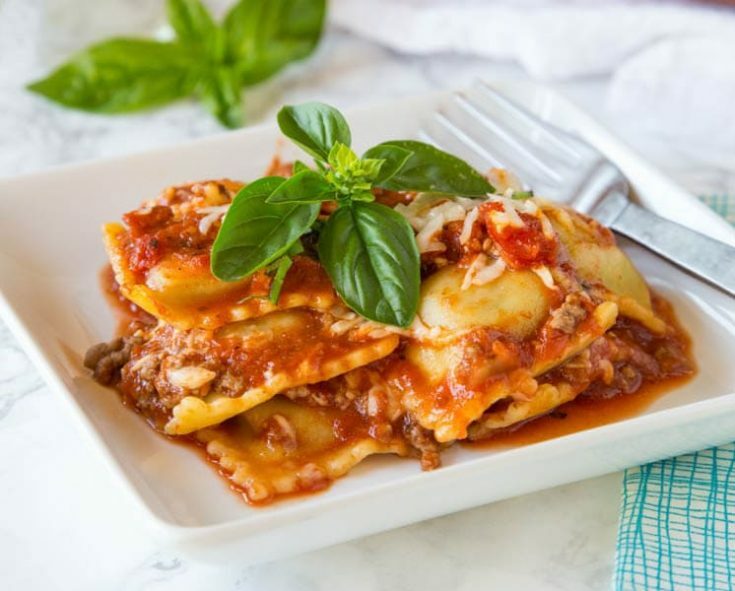 Do you thaw the ravioli before you use it, or use it frozen? Use them frozen – enjoy! Made this tonight, it was excellent! Delicious and easy~ the best of recipes. Added some Italian sausage crumbles because the husband is a carnivore. Printing this out for my husband. Next time it’s his turn to make dinner this is what I want him to make me!!!! 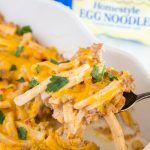 This looks like the perfect Easy dinner recipe!